Experience a New Level of Healing and Transformation with Crystal Infrared Therapy! 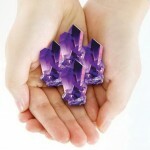 that’s the Amethyst BioMat experience! 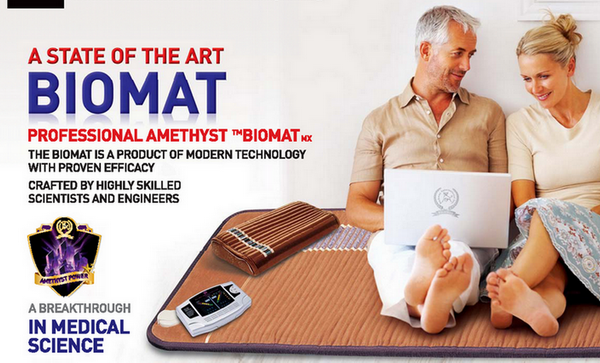 The Amethyst BioMat delivers the highest vibrational resonance deeply into all body tissues. The combination of far infrared light, negative ions and amethyst quartz opens the channels for intelligent cellular communication leading to DNA repair and total body wellness. Science and medicine have come together to develop this medically approved device for home and professional use. The BioMats state-of-the-art light technology reverses degenerative disease cycles and speeds cellular renewal. This allows post traumatic and surgical healing processes to occur 57% faster. Far Infrared Heat is pure energy in the form of LIGHT from the invisible area of the electromagnetic spectrum. Far Infrared Heat was discovered by NASA to be the most beneficial light wave, penetrating the skin and increasing circulation to detoxify the body of harmful toxins and acid wastes. Negative ions are odorless, tasteless and invisible particles that we inhale in abundance near waterfalls, rain forests and oceans. Scientifically they are molecules with an extra electron helping to alleviate allergies, migraines and sinus problems.Once they reach our blood stream Negative Ions have a positive effect on the rate at which Serotonin is oxidized in the bloodstream, resulting in higher alertness, decreased drowsiness, and more mental energy and clarity. Amethyst bolsters the production of the hormones, and strengthens the cleansing organs, the circulatory system and blood.This brings the immune system and body metabolism into balance and harmony. Amethyst also soothes the nervous system and aids in the transmission of neural signals. And memory skills improve with the use of this stone. The statements enclosed herein have not been evaluated by the Food and Drug Administration. The products mentioned on this site are not intended to diagnose, treat, cure, or prevent any disease. Information and statements made are for education purposes and are not intended to replace the advice of your family doctor. Information provided by Richway International. All rights reserved.